Penn Station has developed a unique product line that demonstrates, in full customer view, the true quality of our products. Our menu now features an array of mouth watering Grilled East Coast Style submarine sandwiches, fresh-cut fries and hand-squeezed lemonade. All sandwiches are prepared fresh in full view of the customer using delicious hearth-baked bread, USDA steak and the finest meats, cheeses and vegetables. The potatoes are hand selected, fresh-cut and flash-fried in cholesterol-free peanut oil. The lemonade is made from scratch every day using hand-squeezed lemons. Our restaurants are attractively designed with brightly-lit service lines and colorful interiors that create a radiant, clean appearance. Colorful artwork, background music, television for customer viewing and exposed ceilings create an atmosphere unlike typical quick-service restaurants. A 20 year tradition with a 99.5% success rate. Ranked as one of the top 200 Franchise Opportunities in the U.S. by Entrepreneur Magazine in its Annual Franchise 500 listing. Ranked #1 Restaurant Franchise Company by Success Magazine in its Annual ranking of the top 200 American franchises. Ranked among Powerhouse 50 by Nations Restaurant News. Ranked among Top Tier Franchises by Restaurants & Institutions Magazine. 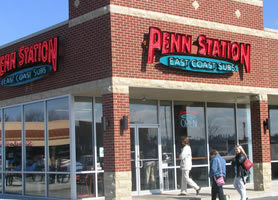 85% of Penn Station East Coast Subs franchisees have opened more than one location! Our extensive Opening Checklist covers all of the nuts and bolts of opening a new restaurant, thereby guiding you toward a successful Grand Opening for your store. A team of seasoned restaurant professionals provides assistance with site evaluation, lease negotiation, marketing and advertising support and training. Customized floor plans for decor and equipment placement and specifications are provided as part of our pre-opening support. Training in our unique One-on-One Program is performed over a three week span in a Penn Station Restaurant. On-site assistance is provided during the intial weeks your store is open. Our Area Supervisors consult with the franchisees regularly, work on site with the management staff and provide guidance in the areas of operations, marketing, food preparation techniques and cost management. purchase contracts with approved suppliers for food, equipment and other services which offer you the benefit of lower costs. All vendor rebates taken as income by many franchisors are used to offset the product cost to the franchisee or retained in a National Fund for the direct benefit of the Penn Station System. Our unique General Manager and ownership program is the backbone of our system and provides the framework for instilling a true owner's mentality in your franchise. An "Owner-Operator" mentality behind the counter results in the highest quality product and service provided to our customers. The Penn Station Operating Manual is our template for success. It defines our systems, techniques and policies which ensure that all customers receive the same high-quality dining experience at each and every unit. A Franchise Advisory Council provides a forum for franchisees to offer suggestions and input towards improving the system which positively impacts operations and customer relations. We are looking for entrepreneurs with prior restaurant experience, seeking growth opportunities for their capital in a proven system with potential for expansion. Franchise opportunities are available throughout the Midwest and Southeast United States. Under certain circumstances, we may consider granting franchises outside these areas. To learn more about the Penn Station East Coast Subs food franchise opportunity, simply complete the form below.